This two year old new big sister lies with her baby brother on a sheep skin rug. They look at each other, the newborn boy making a silly newborn face, and his sister smiling ear to ear as she gets photographed with her new baby! 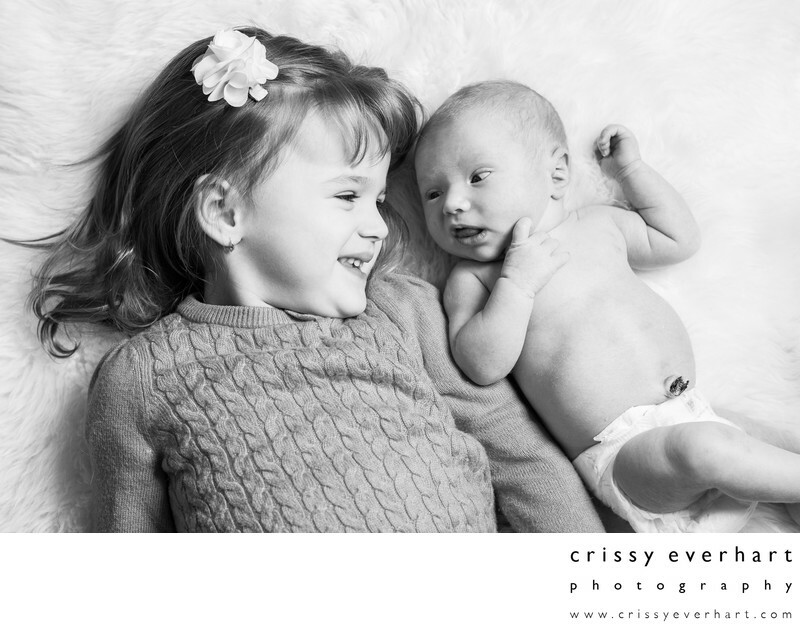 This black and white image was taken at this little guy's newborn session in Montgomery County, PA. Big sister wears a cable knit sweater and a hair bow, and little brother wears a diaper only, his umbilical cord showing. I love having siblings in the photos with their new little brothers or sisters- they are usually very inquisitive about this new creature, and very loving towards them. Second babies are immediately familiar with the sound of their siblings' voices and when you see how comfortable the babies are with their siblings it melts your heart! !